Professor Chris Greer has been at City University London since 2005. His research and teaching interests are in the areas of media criminology, victimology, punishment and social control, and criminological theory. 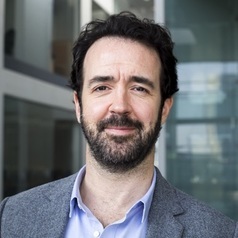 Professor Greer's current research examines the shifting relations between news journalism, institutional power (particularly within the criminal justice system) and civil society in a context of media proliferation, declining deference to authority and a rapidly transforming communications marketplace. Recent publications have examined the rise of 'trial by media' and 'media justice', the press' commodification of institutional failure and scandal, and policy responses to the crimes of the powerful. Professor Greer is a Fellow of the Royal Society of Arts. He is Founding and current Co-editor (with Mark Hamm) of Crime Media Culture: An International Journal. He is also Co-Director of the interdisciplinary Centre for Law, Justice and Journalism, the first centre in the UK to develop a broad yet focused interface between law, justice and journalism in society. Professor Greer has presented his research at a range of international venues, and been a Visiting Scholar in the Faculty of Law, University of Sydney (2005), and John Jay College of Criminal Justice, CUNY, New York (2008).